Also, for your viewing pleasure, we've included Past is Prologue, the prequel web series to get you primed and ready for All Our Yesterdays! 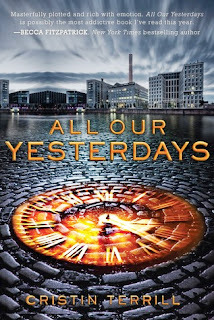 All Our Yesterdays is another futuristic dystopia. In its time, time travel has been figured out and there are very negative consequences. There are two main characters, which turn out to be the same girl, but in different time lines. The love of her life is the creator of the time machine. One of them has had her heart broken by his cruelty, but can she save the other Marina from the same fate? James must be stopped and even though her past selves have failed, Em cannot fail this time. She has to save herself from the future only one version of herself knows about. This book was very complicated in the way that it unraveled. I truly enjoyed each discovery that Terrill gives you throughout the book and she really made me use my brain to figure out a lot of the plot. She is a very talented writer and most of the book was amazingly thought out with a lot of attention to detail. I was enthralled by the love story. Marina loved someone in the past that she hated in the future. How do you separate a person that way? I couldn’t imagine being faced with the decisions she was. I was in love with this book right up until the last few pages when some crazy stuff happens. I would never give away the ending to a great book, but I hated this finish. When everything had made such perfectly logical sense throughout the whole book, it was very disappointing to get to the end and have something happen that doesn’t make sense at all. And, because it was the end, there was absolutely no explanation for how it occurred. Even with the disappointing ending, I still really enjoyed this book and I would recommend it. I just wish I could have a sit down with Terrill so she could explain to me how the ending was possible. 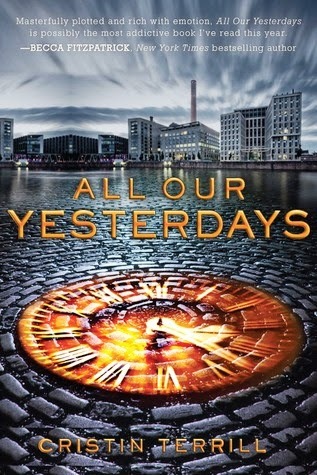 We were lucky enough to get an ARC* of All Our Yesterdays at Book Expo America and you know we live to share the bounty with you, Steph's Stackers. So, ready to win this great book (frustrating ending and all)? Alrighty then, get to tweeting, Facebooking and general following and start racking those entries up! Don't forget to hit up the Freebie! *Advance Review Copy - Bear in mind, this copy is intended to get the word out about a novel. This copy may differ from the final version in terms of formatting, plot points and cover. ARC's are uncorrected proofs and not intended to sell. If I could go back in time it would not be easy to not tamper with my history, but one little change could mean the difference in every thing. I might not be alive if I did and certainly would not be the same person. So given the choice I don't think I would. Thanks for the Chance to win the awesome giveaway. No I wouldn't change a thing! Of course we all did things were not proud of, but they make us who we are today! I have a blessed life now and wouldn't change it for nothing! Thanks for the giveaway! Not a chance. I love the "just for being AWESOME" entry.....sometimes I need the reminder. Oh, and you're pretty awesome too! I don't think I would go back, there are some things that I would have liked to have done differently, but I would not want to loose the things that have the most meaning in my life. I also have to say I love the cover of this book.